Keeping our design simplicity line of this weeks posting, how about a color changing umbrella that brightens up the rainy days. We featured the color changing umbrellas designed by SquidLondon earlier but the new, color splash design which is available from UrbanTrim for $38.- is definitely an eye catching, colorful break on a otherwise dull rainy day. The umbrella starts out in black and white. 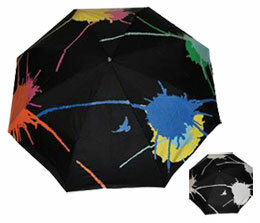 As the rain starts falling on the umbrella, each drop will cause the colorful design to show through. Eventually when the whole umbrella is wet it will have morphed into the vibrant colorful version that you can see in the photo. When the rain stops and the umbrella dries the colorful design will slowly fade back to white, ready for your next rainy adventure. The color chaining miracle is made possible by Hydrochromic ink which reacts with water, chaining from one color stage to another. All the different colors start out as white and then showing their second personality when coming in contact with water.